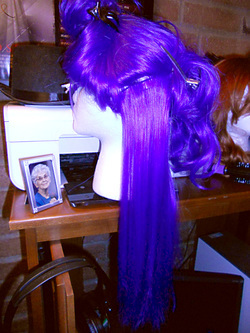 I didn't take a "before" picture, so this is from Arda Wigs' site. The picture is linked to the page for the Ferrari Classic. I wanted a wig that would work better for Miho. I thought the Electric Purple was a good shade. Unfortunately it tends to look that blue. Sometimes in warm lighting, the purple comes out more, but it just wasn't quite right. But I wasn't really worried about that. I just wanted a medium-length wig that color with bangs that was straight. I couldn't find the combination, but I knew I could straighten a Ferrari. 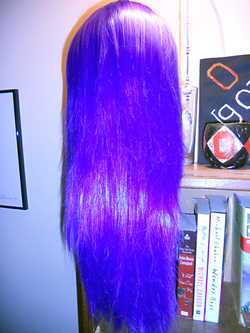 I pulled most of the hair up and out of the way, leaving only a small section of a few rows of wefts. I let my hair straightener warm up, on a medium setting, and gently ran it down the length of the hair. The ends were a little frizzy, but otherwise it worked great! 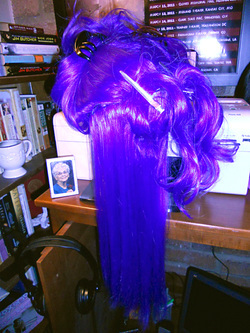 As I completed a section, I would work around the wig until one entire section of wefts was done. Then I sectioned off another few layers and kept going. In the end I got this! 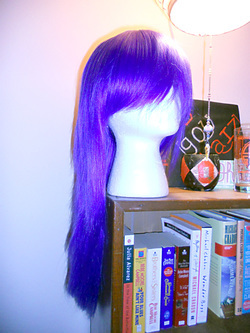 A nice, straight Electric Purple wig with bangs. Now if I could have just picked out a better color! Oh well, it's still a great wig. Do not attempt this with any wig that does not directly state that it is heat-resistant! Arda Wigs' Classic wig line is heat-resistant and can be styled with direct heat, like a straightening iron, a hair dryer, etc. If you have a wig you're not sure is heat-resistant, or know it isn't, your best bet is to use hot water poured over the wig to achieve the look you want. Even then, test it out on an area where if you mess up, no one will see it.